Living your passion on your own terms in a crazy world. Because, it’s time. There is so much “convincing” being passed around that it really matters to know your own thoughts, feelings and opinions on any subject you feel passionate about. And to be sure, not everyone will be in agreement with your passion about it, nor do they need to be. Your passion has nothing to do with anyone else’s. You don’t need permission or approval. I’m pretty sure that we didn’t all get together on the other side one day, at a coffee shop and plan to come here at the same time and agree on everything. Where’s the free will in that? The important part isn’t in finding a large Tribe to back you up (although our egos love to chuff when that happens) that has nothing to do with Mastery. Mastery training is when you don’t need to convince anyone of anything, you don’t need them to change, or hear you out, or even be clear on your why’s and how’s. Mastery happens in the quiet moments, the subtle tones, when you just feel good about what is right for you and you do it. Period. Mastery is Righteous but only for you, by you. There is just you, listening to your own Soul’s guidance about what is right for you, true for you, healing, healthy, wise, soothing, passionate, exciting, inviting, riveting for you -you get the idea here- and following it to the next logical space. Whether it is a cause you want help, or a project that lights you up, the ones that work out are always the ones that you experienced a subtle frequency resonance with. Ask yourself these questions before taking any actions. If you answer no to any of the above, it is not for you. Period. No judgment, no self-shaming (because I should care about this!) No long calls with friends to check if you’re a good person. An honest no just means it’s not part of your Mastery training. We each hold ourselves to different levels of standards and we cannot presume to know what something means to someone else’s soul. Only our Souls know the road ahead. So please stop trying to fit in, or please others, or convince everyone you know to join you in supporting anything. Just do it because it matters to you. There are as many ways to thrive and also be of service as there are human beings on the planet. And please, be very, very choosy. You could end up doing it for a really long time. If it’s not calling your Soul, move on, with full permission from yourself. But if it does call to you, let no one else convince you otherwise. Don’t get caught up in basing your “being right with the Light” on being in agreement with any of your Tribe members. You’re not here to gather in numbers. Remember, one person “right with the Light inside them” is more powerful than literally millions who are not. So don’t listen to the spin and don’t buy into the herd thinking. Your Soul knows the path for you filled with the best experiences you will love the most, if you take time to slow down and tune into it. When you tune into that subtle and oh so personal frequency ban you are wired to, your body knows immediately. You begin to breathe differently, your cells oxygenate and you begin to relax and open up. You open the energy conversation that you are having with the Universe. In other words, you open to allowing your Soul to guide you. If you want anyone to have your back, it’s your own Soul and your She Wisdom™ , leading the way. 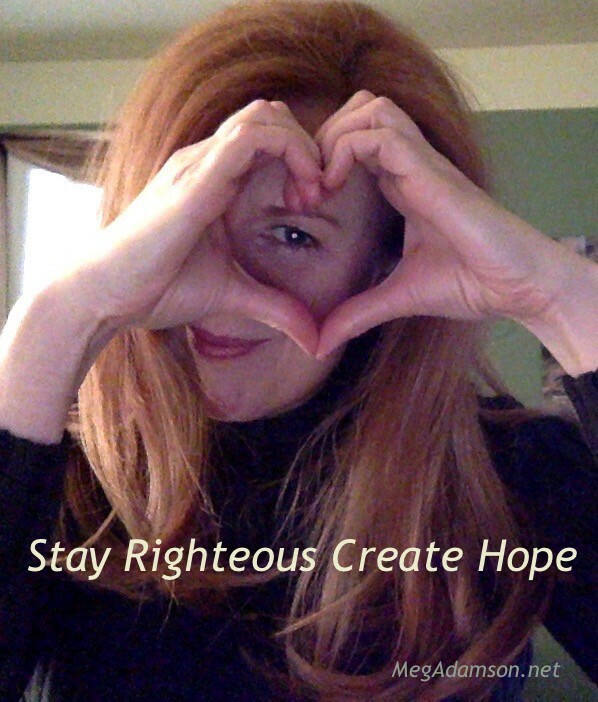 When we align with ourselves in this way, we create Hope everywhere we are witnessed. Hope to Mother Earth is like an essential mineral and currently she is deficient, but that can change. Remember, one person in alignment with themselves is more powerful and effective than millions who are not. So stop reacting to the news, it’s geared to fill you with fear. Start cheering on the Hope squad. Perform random acts of kindness. Give compliments like after dinner mints. Find your Gratitude. Keep it close, like deep personal magic. Investigate where you feel you can be of service to the greater whole and jump in. And remember that it’s always your game. You are never small in fact you matter greatly. I know many of us feel the world’s pain, but I’ve written previously about important and divine self care. See my article Gratitude is a Lifeline. Stories only repeat themselves when we tell them over and over until they become truths. Make Hope a new truth. If you want to study with me personally, be sure to check out my private session work available, my NEW Audio LoveCast Trust Your Light:The 5 Basic Principles to Living a Meaningful Life and my personal study course Thrive.